The Harbor on the whole is still pretty dormant during the month of February and I was having a bit of trouble deciding what to write about in this month’s column when my friend Rachel Dinbokowitz – who just happens to be the Marketing Manager at the Gaylord – came to the rescue. She sent me some press info about some fabulous things happening at the spa in the resort this month. When it comes to experiential escapes to celebrate Valentine’s Day, look no further than a spa day. Relâche Spa at Gaylord National Resort and Convention Center is offering three ways to spa this February including an exclusive night out at the spa for two – an overnight spa package at the luxurious 19-story resort and three new treatments infused with the most romantic scent of all, frangipani. For the ultimate romantic escape, Relâche Spa’s A Night at Relâche package literally shuts down the spa for a private experience for one couple. These two guests enjoy a champagne toast; 80-minute couples massage in the spa’s couple’s suite that overlooks the Potomac River; private use of all spa amenities including its sauna, steam room and whirl pools; spa robes to keep; and gourmet bites selected by the resort’s executive chef. The three-hour all-access pass is offered from 9:30 p.m. to 12:30 a.m. and must be booked 7 days in advance by calling 301-965-4400. The package starts $1,500. If renting out the spa for a loved one is outside ones budget, guests can choose an overnight spa getaway with the Relax at Relâche package. Couples can select one of three spa experiences – a massage, facial or manicure and pedicure – and experience overnight accommodations at the Hotel. This package starts at $429 and can be booked at GaylordNational.com or by calling 301-965-4000. Couples aren’t the only ones that can join in on a February spa escape. Relâche Spa is introducing three new frangipani treatments that are the perfect gift to celebrate loving oneself or enticing the love of others. The fragrant flower’s essential oils are known to provide its users with harmony, self-confidence, stress-relief, antioxidants, soft skin and a scent that acts as an aphrodisiac. Spa-goers can plan their next love spell when choosing between a 50-minute soothing massage, a 50-minute anti-aging facial and 50-minute luxurious pedicure. To experience all three services for the ultimate rejuvenating experience, the cost is $345 on Mondays through Thursdays and $370 on Fridays through Sundays. Each service is also offered individually with prices starting from $80. I can smell the frangipani now! Relâche Spa is an award-winning, full-service spa and salon located within the Resort. Its core philosophy stems from its name, Relâche, which comes from the French to “let go” or “take a breather.” As one of the largest resort spas in the Capital Region, Relâche Spa offers massages, body treatments, facials and salon services, as well as a unique couples massage room, Riverview Relaxation Lounge, sauna, steam room and whirl pool. 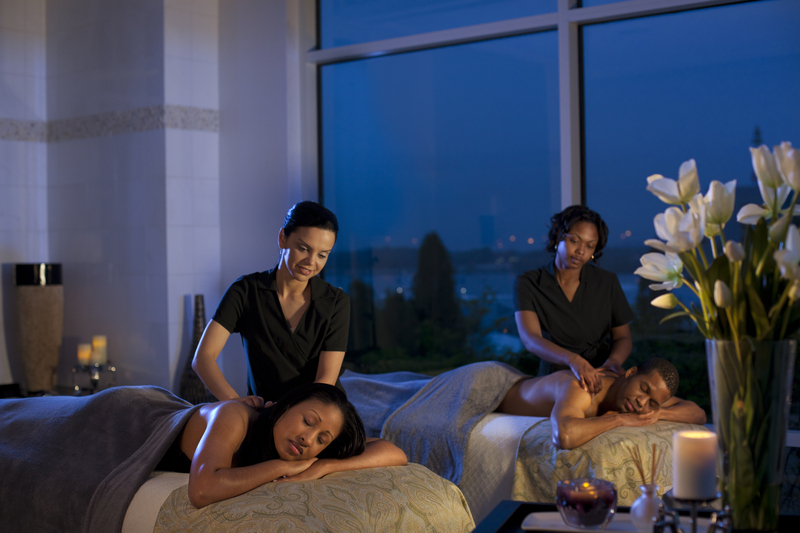 For more information about Relâche Spa and its February offerings, visit EscapeToRelacheSpa.com, call 301-965-4400 and follow on Facebook.com/GaylordNationalRelache. The other action taking place in February is National Harbor’s annual Restaurant Week. It takes place February 4th through the 10th and there are more than a dozen participating restaurants this year. Like the Restaurant Weeks in Old Town and DC, there are special menus offered at reduced prices and this year the restaurants in The District area of the MGM Grand are participating. Dinner menus are available for $38, lunch menus for $20 and this Restaurant Week includes entertainment options as well. The Capital Wheel, National Harbor’s 180-foot observation wheel, will offer two tickets for $22 that must be purchased at NationalHarbor.com/RestaurantWeek and Bobby McKey’s Dueling Piano Bar will offer free cover with a Restaurant Week receipt (this offer is valid only during restaurant week.). Participating restaurants include not only some of the best eateries in the Washington DC metro area including the highly popular Ed Lee’s Succotash, The Walrus Oyster and Ale House, and one of the Old Town Crier’s favorites, Bond 45. Deborah Topcik, Director of Marketing for National Harbor told us, “We are excited to have the largest number of restaurants participating this year including MGM National Harbor’s Tap Sports Bar, Ginger, Voltaggio Brothers Steak House, and Fish by Jose Andrés. Each of our restaurants provide a unique experience for our guests and there is truly something for everyone.” For more information visit NationalHarbor.com/RestaurantWeek.